An aquaculture practice, previously used in China for freshwater trout farming and in Washington state to raise coho salmon, has finally come to BC coastal waters. Outside of Campbell River in Middle Bay, the first contained salmon farming tank will be up and running. 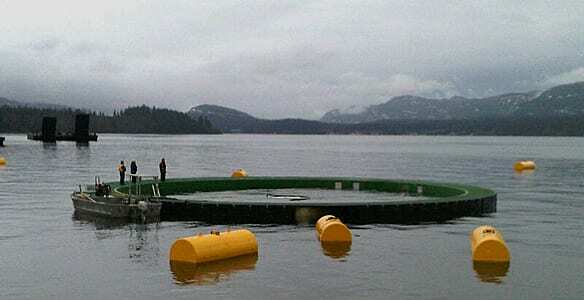 Previously, BC salmon farms have used open-net pens, meaning they are open to the ocean. As such, they have been criticized for damaging the marine environment around them – transmitting parasites, pathogens, and sea lice – harming wild fish stocks and and surrounding ocean life. Researchers and environmental groups have been lobbying for contained farming for years. They argue it is a more sustainable fish farming practice. AgriMarine Holdings Inc.‘s floating fish tanks are expected to have minimal impact on their surrounding environments. With this system, farmers have more control over the quality of the water the fish are raised in, as they can monitor the waste filtered out of the system. The first tank, to be complete in the next couple of weeks, will contain chinook salmon. [Read full article].